Alexandra House keeps both offline (mailed checks, etc.) and online donor information confidential and will not share or sell a donor’s personal information with anyone else, nor send donor mailings on behalf of other organizations. Should a donor have questions about the ethical practice and security of their information, they may contact Tina Bronson, Communications Marketing Director, at 763-656-1363 or by email at tbronson@alexandrahouse.org. 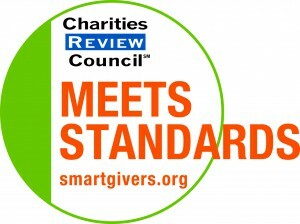 Donors can give with confidence knowing that Alexandra House has completed the Charities Review Councils, Accountability Standards®,and has received the “Meets Standards” seal.